The Pod Pro charges Apple Watch and iPhone simultaneously. Nomad Rugged Strap with Black hardware shown above. Charging the Apple Watch while traveling can be a little tricky. Generally, I lug along a super-long charging cable and a wall plug to get the job done when on holiday. Nomad — makers of great Apple Watch straps and accessories — offers a stylish and super-portable charging solution called the Pod Pro. 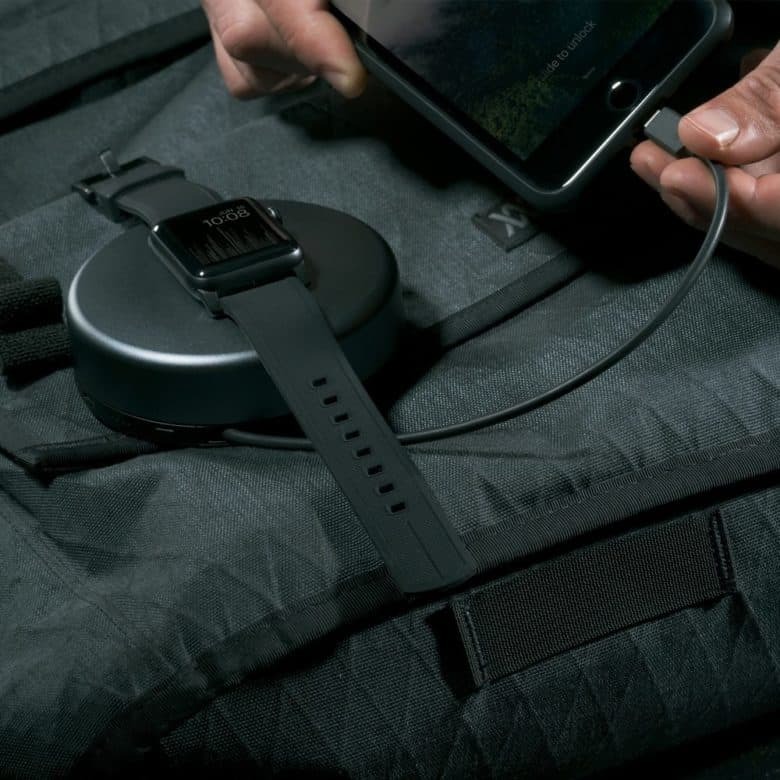 The Pod Pro wraps that lengthy charging cable neatly inside a stylish, round enclosure that also holds a massive 6000 mAh of power — enough to keep Apple Watch juiced up all weekend long. Read on to learn more about this amazing, portable charging puck, and check out the Pod Pro in our Watch Store! 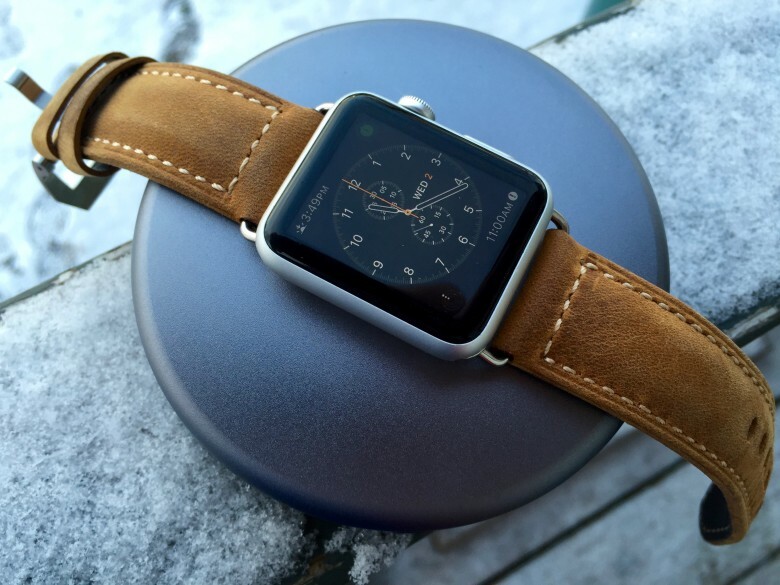 The Nomad Pod Pro charging Apple Watch (that’s Nomad’s Traditional Strap shown above). The Pod Pro can charge an iPhone 8 and Apple Watch twice each with its integrated Lightning cable before going flat. Simply charge up this little pod and toss it in a travel bag; I’ll be able to keep my watch and phone in the juice for a good while. The battery-powered pod has a built-in cable-management and charging system for your Apple Watch and charger. Simply twist off the Pod Pro’s aluminum top to reveal the USB port, plug in the Apple Watch charging cable, wrap the cable around the Pod’s body, and secure Apple Watch to the charging puck. 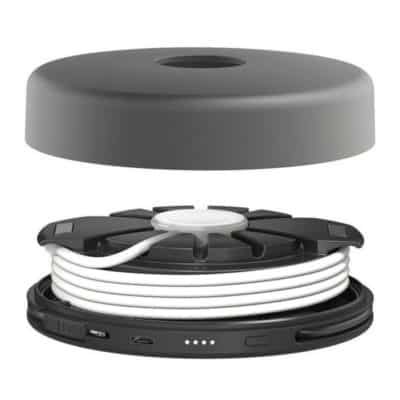 A round anodized aluminum cover fits over the top of it all and is held in place by magnets. The end result is a hockey puck-shaped Pod that Apple Watch rests atop. Charge the Pod itself via micro USB — it only takes a couple hours to fully charge the Pod Pro, though it will juice up my Apple Watch first (if it’s sitting on the Pod). Three little LED lights help me keep track of how much power remains, which is very handy. A rubberized foot affixed to the Pod keeps it stable and in place. Ultimately, Nomad’s Pod for Apple Watch is a fantastic way to keep Apple Watch charged up and ready to go at a moment’s notice. It’s easy to plug into a micro USB on a night table and use for Apple Watch storage overnight, and just as easy to grab and go when you need a portable charger. The Pod Pro comes in Space Gray. Nomad provided Cult of Mac with a review unit for this article. See Cult of Mac’s reviews policy; and check out more stuff we recommend in our Best List reviews.